Jeff Burdsall is our bubble boy in event 33. He got his last 10,000 chips in on 3rd street against David Benyamine in a very tight matchup. Burdsall had (A )(6 )5 and Benyamine had (A )(4 )8 . When the cards were on the felt, it was Benyamine’s ace-to-five straight – A 4 8 3 2 K 5 – that took down the pot. Though we are now in the money, don’t expect the speed of play to pick up too much. There are only a couple of short stacks at the moment; most of the players have fairly healthy stack sizes. Hasan Habib narrowly missed going out in 25th place when he was all-in with (9 )(5 )A A against Kirill Gerasimov’s (3 )(3 )8 8 . Habib was granted a reprieve when he paired his 9 on 6th street, making him a better two pair and doubling him up to 28,000. 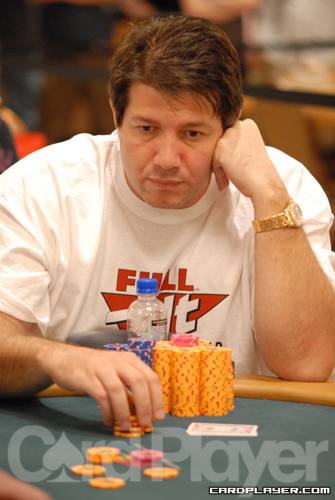 A few hands earlier at the same table, Barry Greenstein ended J.W. Smith’s night early (...at 12:45 a.m.) when he made a full house – fives full of eights – crushing any hopes that Smith had of making the money in this event. Ganger bet again. Lee folded this time, and after a good bit of staring at the felt and shaking his head, Ferguson made the call. Ganger flipped 7 6 9 and scooped the pot, bringing him to 107,000. Ferguson has 100,000 left, and Lee was eliminated on the very next hand. Jun 12, '08 2008 39th Annual World Series of Poker Event 22 - H.O.R.S.E. Mark Vos got the majority of his 9,000 chips in pre-flop against Yueqi Zhu and the rest went in on a K 5 3 flop. “That’s a good flop for me,” said Vos. It was indeed, as Vos turned over A K . Zhu’s 7 7 was drawing to two outs. The J on the turn was unimportant, but the river was a stunning 7 , eliciting an emphatic “Yes!” from Zhu and causing Vos to spring from his chair and leave the area in incredibly swift fashion. Zhu is now up to quite a hale 35,500. Seated right next to one another, Todd Brunson and Kevin “bel0wab0ve” Saul tangled in a pot. Brunson raised from the small blind and Saul called from the big blind. The flop came A Q 4 and Brunson bet into Saul. Saul called and the duo saw a 3 turn. Brunson checked this time, but called after Saul’s bet of 1,600. Brunson wasn’t so keen about the 6 on the river apparently, as he check-folded, dropping his stack down to 39,000. 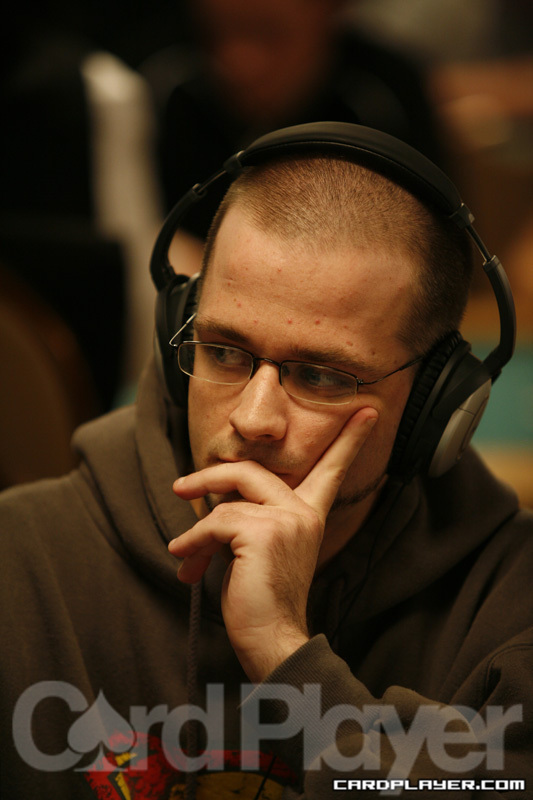 Kevin Saul’s stack of 57,000 is now top among the chip leaders. After a great deal of betting pre-flop and on the flop, Mark Roland found himself all in against Max Pescatori on a 10 4 3 flop. Pescatori declared that he had nut-nut and flopped over A 6 3 3 , a decidedly non-nut hand but still good for a set of threes. Mark Roland showed the goods however (as good as a series of draws can be anyway), revealing A A 7 2 for the nut flush draw, a gutshot straight draw and the nut low draw. The river was the 9 , which didn’t help Roland at all. But the J on the river was Roland’s saving grace, giving him the entire pot and doubling him up to 14,000. Pescatori’s loss drops him to 18,000.